According to Wikipedia, there are 32 notable athletes with the first name Eugenio. Among them are the likes of retired handballer Eugenio Serrano, and the luchador Eugenio “Konan Big” Torres Villarreal. There’s even a baseball player on there, Eugenio Velez! You might remember Velez as the guy who wore the “SAN FRANCICSO” jersey, or for being the MLB record-holder for most consecutive at-bats without a hit (46). You know who’s *not* one of The 32 Eugenios? 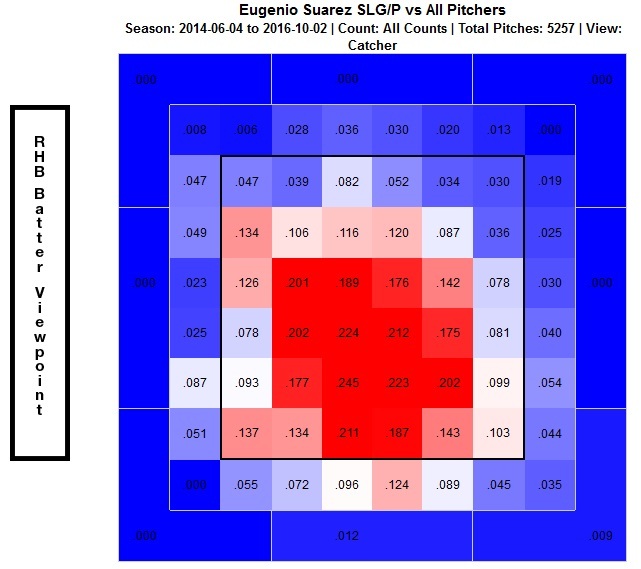 Eugenio Suarez, that’s who! As if this wasn’t enough of a crime already, one of The 32 is named Eugenio Suarez Santos, a low-level Spanish footballer. It’s like the Wikipedia curator (is that a thing) for #The32Eugenios — an undoubtedly high-level position within the internal Wikiheirarchy — decided that one Eugenio Suarez was enough for this list, and went with the soccer player whose most notable achievement was a season-long scoreless streak that coincided with his team’s relegation to the Spanish third division. Meanwhile, Cincinnati Reds third baseman Eugenio Suarez — almost definitely motivated by his Wikipedia snub — is making his case to be the best Eugenio of them all. While we’re still in small-sample land, we’re not quite in teeny-tiny-sampleville anymore, and Suarez looks like he may be in the midst of a breakout. 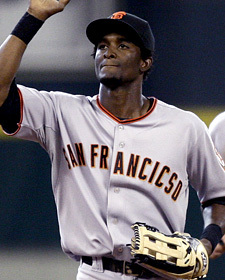 Through the season’s first three weeks, the 25-year-old has a monstrous .371/.458/.742 slash. He is punishing the ball at a rate that puts him amidst the top five hitters in the league in isolated power, with a .371 ISO. The other four? They would be Eric Thames, Freddie Freeman, Bryce Harper and Aaron Judge. 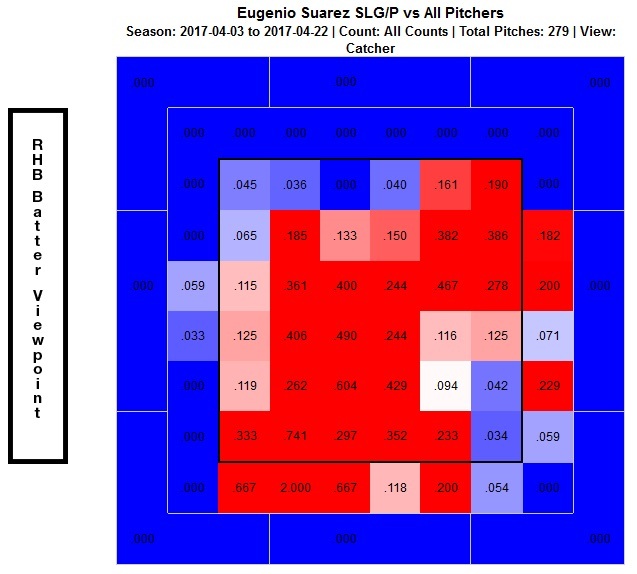 Let’s dig into Suarez’s 72-PA sample to see how he’s generating these big numbers, and try to determine how much of this is for real. With a .400 BABIP and a third of his fly balls leaving the park, there’s obviously some regression coming. The question is how much. Currently, Suarez doesn’t look like he’s getting especially lucky. Lots of hard-hit balls (39.6% Hard) and a ton of line drives (27.1% LD) is a combination that always puts runs on the board. 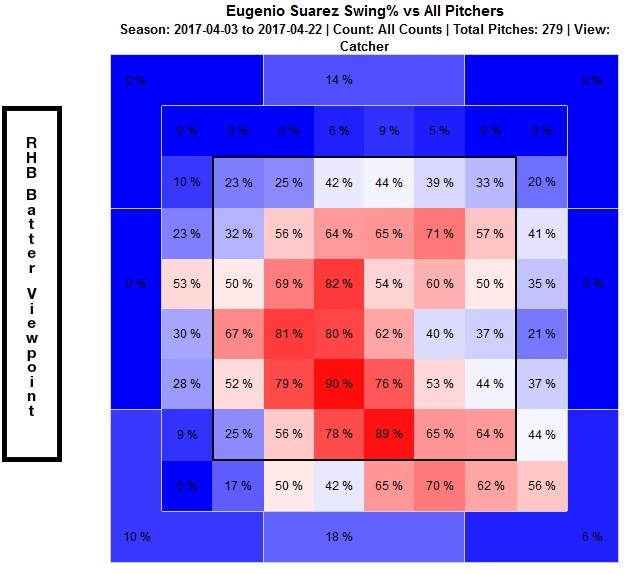 Where Suarez gets particularly interesting is when you realize he’s much less pull-happy this year, as he sports identical 35.4% Pull and Oppo rates, with the other 29.2% of his batted balls going up the middle. This made me take a look at his heat maps to see if he’s attacking outside pitches differently. The answer is yes, he is, but it’s not even the most significant adjustment he’s making. In a great many ways, Suarez is performing at levels he never reached in his first three seasons. Yes, it’s still a small sample, but this isn’t just a player doing a better version what he normally does. This is a player producing at an unprecedented personal level, and doing so using fresh tactics. This is a player who identified the holes in his swing and successfully changed his approach to patch them up. 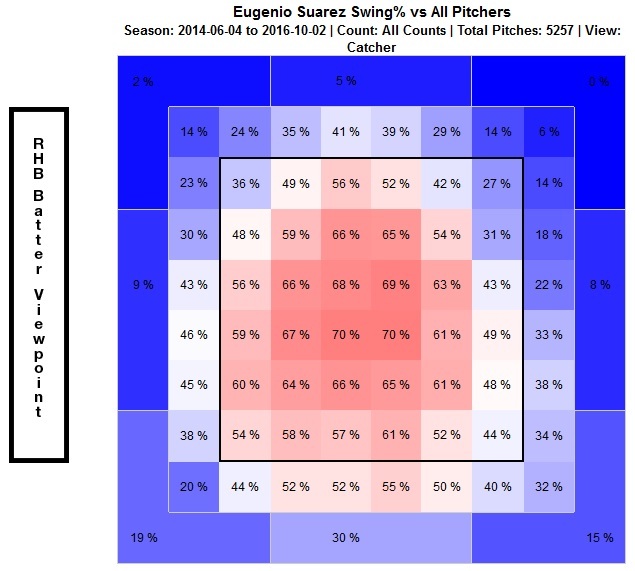 This is Eugenio Suarez breaking out. We hoped you liked reading The 33rd Eugenio: A Suarez Story by Scott Strandberg!